On Monday, June 13, I ran a different route after work. Instead of my typical two-mile loop around West Philadelphia, I ran to City Hall. And instead of my post-run beer, I sang “True Colors” with a couple of thousand other Philadelphians. 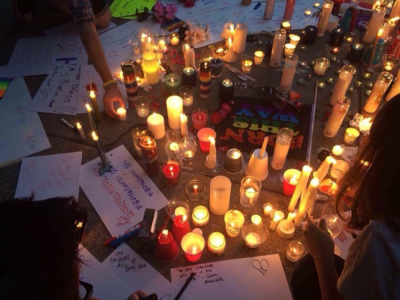 This photo was taken at the vigil I attended in the wake of the Orlando shooting. As a proud member of the lesbian, gay, bisexual and transgender (LGBT) community, the most recent Orlando shooting was close to home. For many of us in the LGBT community, gay bars and clubs are more than a place to dance or meet up on the weekend. They are…were…our safe havens, a place to go to be true to ourselves without fear of glares, or worse, violence. Fear of violence is not new in my community. I am keenly aware of the places I cannot hold my fiancée’s hand or even steal a quick kiss. Although I feel safer in cities that are more openly tolerant of their LGBT communities, we can never fully let our guard down. 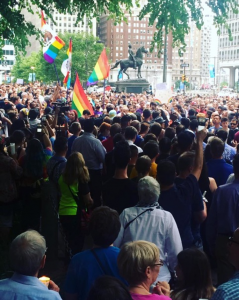 Just two years ago, a gay couple walking in Philadelphia’s Gayborhood (a section of Philadelphia with some of the city’s finest restaurants, theaters and art galleries – and clearly marked by rainbow street signs) was attacked by a group young men and women – they beat the one man so hard that he suffered two broken cheek bones. According to the FBI, in 2014 there were 1,248 recorded hate crimes against the LGBT community. Those are the ones we know about. In fact, the Southern Poverty Law Center has found “LGBT people are more than twice as likely to be the target of a violent hate-crime than Jews or black people.” Furthermore, approximately 55 percent of LGBT individuals have experienced verbal harassment and about 41 percent have experienced discrimination. In most states, it’s legal to discriminate against someone for being gay or trans. It can cost you your job, or even a place to live. At first glance, it makes sense. After all, 547 people have been murdered and 476 injured in mass shootings over the past 30 years, and this doesn’t count the shootings that happened after 2013. In fact, we’ve had on average 16.4 shootings per year from 2007 to 2013. That’s more than one shooting per month, every month, for six years. These events are large scale, unpredictable and highly traumatic. And while reforms are needed, we must resist the urge to enact discriminatory, unjust laws and ineffective polices, in moments of tragedy. The No Fly No Buy policy can be summarized as follows: a person placed on the terrorist watch-list would be prevented from buying a gun. No, I’m not advocating for terrorists to be able to buy guns. Rather, I’m suggesting that the No Fly No Buy fuels our xenophobia and racism, and is highly ineffective. Back in 2003, President Bush created the Terrorist Screening Database (TSDB). Run by the FBI, the TSDB allows law enforcement agencies to share information. Agencies can nominate individuals to the TSDB and if there is enough reasonable suspicion, s/he may be placed on the no fly list. Unfortunately, the individual accused has no ability to confront her or his accuser. Even those in support of the TSBD agree it is not perfect. In 2014, there were 800,000 names with 64,000 on the no-fly list. The problem is it feels just. Terrorists should not have guns. Yet, this would unfairly deny Americans their right to purchase a weapon and prevents Americans from traveling freely. I’m not romanticizing the Second Amendment. In full disclosure, I’m not a fan. As a member of a minority group, one that faces hate-crimes, and knows what it is like to be discriminated against, I cannot – even in the wake of the Orlando shooting – support a law that discriminates against the group du-jour. Today it is Muslims. Tomorrow? A law that denies individuals the right to face their accuser. Each year, 32,514 people die from gun violence. We must resist the urge to have knee-jerk public policy. We must use reason and evidence to lead, especially in hard times. Easy access to guns fuels both mass shootings and other gun violence. However, “No Fly No Buy” fails to address the real problem. As a friend of mine said, it’s saving the curtains while the house burns. Author: Laura Caccioppoli is a millennial and a recent graduate from Villanova University with an MA in political science and a graduate certificate in nonprofit management. She currently works at University of the Sciences and serves on the board for The Consortium in Philadelphia and Americans for Democratic Action, Southeastern Pennsylvania Chapter. Her research interests are in health and food policy, cultural competency and social justice. Thank you for this thoughtful reflection. One issue that I have with your article is that the numbers presented about the size of the list (that it represents 1 in every 10 Americans) is wrong. If you check the link you provided in your article, you will notice that it mentions that “one in 10 is an American” and not that the list covers 1 of every 10. For the list to cover 1 in 10 American (10%) it has to be 30,000,000 since we are 300,000,000 people. You are absolutely correct! I’ll see if we can’t get a correction added to this article — I knew the number seemed outrageously high. I reread but seems there was some bias I could not overcome.